← why not require high school students to pass the citizenship exam? The situation involving Greece and the European Union is a complex game, with numerous players and potentially many phases. Just as an example, voters in Spain are players who will have a chance to choose the new government in December; they may opt to support Podemos, the relatively left-wing Spanish party, if they think that the Greeks did well by choosing Syriza last week. Nevertheless, we can dramatically simplify the game to have two key players: Greek Prime Minister Alexis Tsipras and German Chancellor Angela Merkel. Tsipras can accept some level of debt relief, from zero to 100%, or walk out of the Euro. Merkel can support some level of debt relief, or let Greece walk. There are principles on both sides. My sympathies lie much closer to Syriza, on the grounds that: austerity is generally bad economics; Greek residents count for as much (morally) as Northern Europeans; and the Greek meltdown, although abetted by poor national governance, was mainly a consequence of neoliberal economic policies driven by Germany and other Northern economies in their interests. However, a German Christian Democrat or a British Tory could make a sincere case against leniency, based on moral hazard, the virtues of fiscal responsibility, Greeks’ responsibility for Greek debt, and other such arguments. In this case, Mr. Tsipras could opt to be hard or soft in his approach to the European Central Bank and other key European players. Fisher and Ury would predict that either approach will yield a bad outcome for Greece and for Europe as a whole, because people have systematic weaknesses that make positional bargaining go badly, whether the players opt to be nice or tough. By the way, that prediction holds even if Mr. Tsipras is completely correct on all matters of principle: this is a game, not a seminar. “Separate the people from the problem.” Create settings in which negotiators who have not publicly defined one another as adversaries are asked to address the problem and propose solutions. Interests: Drop the debate about principles (ban words like “neoliberalism” and “fiscal responsibility”) and just try to maximize the outcomes for the various parties. Criteria: bring in a neutral party to establish concretely measurable objectives. 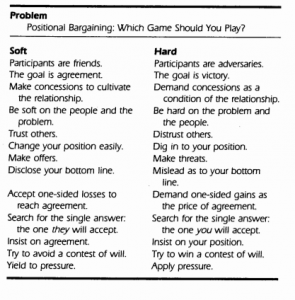 Don’t ask how much each player must (or should) give up, but rather whether the agreement maximizes these objectives. There is much more in the book, but this offers a flavor.